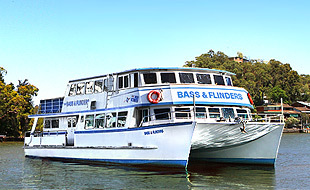 For a memorable wedding on the water with us at Bass and Flinders, you can choose from a wide range of venues and packages. 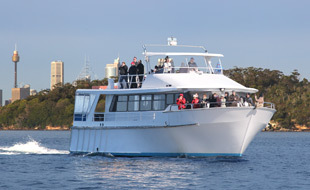 Birthday charters can be casual affairs to celebrate with family and friends, formal occasions or parties with mates. 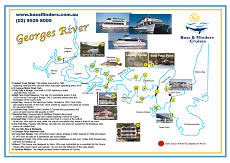 If you are looking for a table service, cocktail function or a more casual and laid back reception on the Georges River, we can help arrange your party to suit. Looking for your Christmas party? we have special menus and options for the festive season, as well as catering for small groups on scheduled cruises to large charters of 400 passengers. Corporate charters demand the best in service and quality to match your business image, at Bass & Flinders we have over 27 years experience providing for every type of function. Special Occasions can be casual affairs to celebrate with family and friends, formal occasions or parties with close mates. We offer many custom services for Conventions and Transfers for groups from 2 to 450. This wide stable vessel with stylish decks provides an ideal location for wedding photos, socialising with friends and colleagues or just enjoying the view. On board 'NTW Allan' is certainly an impressive way to hold a function. Enjoy the nautical atmosphere from the upper deck, or visit the bar in the main saloon area. 'That's Life' boasts two large decks with extensive views from anywhere on the boat to make the most of the picturesque scenery of the long and winding Georges River.